Love the knitted charms of Yarny in Unravel? Good news, the red little critter is getting a sequel from Swedish devs Coldwood Interactive. EA executive vice president Patrick Soderlund confirmed on the EA Blog that the company has signed a new agreement to work on Coldwood's next project. At no point is Unravel 2 mentioned in the post but an email received by PC Gamer confirmed that this will indeed be a follow up to Yarny's original adventures. 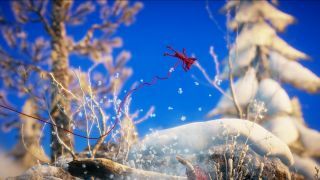 "Earlier this year, we released Unravel, a one-of-a-kind, physics-based puzzle platformer that captured the hearts of players around the world. The awesomely creative development team at Coldwood Interactive brought tiny, endearing Yarny to life," said Soderlund. "At EA, we love working with creative and passionate development teams, in our own studios and our partners. Which is why I’m very pleased to announce that we’ve signed a new agreement with Coldwood to work with them on their next project." Soderlund went on to say he had no more information to share but at least we know it'll be Unravel shaped. I absolutely adored Yarny's adventures and really didn't expect to share as many bittersweet tears.